And, once again, Bruce is back. This time it's his fifth summer with us in our pond, and every spring I'm more delighted to see him again - and not just because it means winter's over at last. Each time I wonder where he's been hibernating - under the soil or the water, in the middle of some plant, or even some distance away - and how old he is and how much longer we're likely to enjoy seeing him sunning himself on the edge of the pond, throat throbbing, and hearing him croak away at all hours of the day and night. It's sad to think all that calling will be in vain again as, after 5 years, if there were any other frogs in the vicinity they would surely have found their way to Bruce. It's Bruce, of course, because he's an Aussie, a green and golden bell frog, one of the many unofficial imports we have here, like spur-winged plovers, rosella parrots and white-tailed spiders - some more welcome than others. Let's not even mention possums (and they were deliberately introduced). Many of them came under their own steam, which is impressive, and others were helped by people no doubt dissatisfied with the unassumingly muted colours and unremarkable song of the natives compared with the rowdy and gaudy Aussies (I'm making no sneaky national generalisations here - if you want to, I couldn't possibly comment). 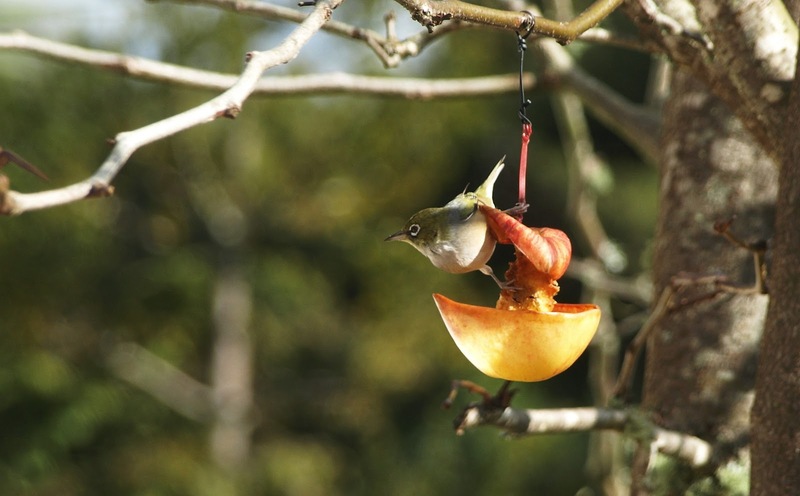 There are fewer than I used to think, before I learned the difference between native and endemic - having always heard the silvereye, for example, called a native, I was confused to see it in Australia, and wondered in which country it was introduced. Neither, it turns out: it's native to both countries, but endemic in neither. The kiwi, though, is endemic here - as well as a native, of course. Glad to have cleared that up for you. Now I must go and replace that apple.